A surprising number of otherwise sophisticated investors confuse the yield on a yieldco stock with its cost of capital. These are not the same thing. Consider two yieldcos that are identical except that investors expect one to grow at 5% and the other at 10%. The cost of capital for these two companies will be the same, but the one growing at 10% will have a higher stock price and therefore a lower yield. All of the above should account for any risks associated with the future distributions from the yieldco. These might arise due to changes in tax law affecting yieldcos or financial difficulties at a sponsor, for example. They should also take into account the benefit of diversification, since the yieldcos often own assets with different technologies, in different geographies, with different contracted customers. In this post, we are primarily concerned with the cost of yieldco equity (both levered and unlevered). An investor or developer might also be interested in asset-specific costs of capital, such as for a single wind farm. The cost of capital for such a project would not suffer from any potential risks from the yieldco structure, but would be handicapped by lack of diversification. We estimated the cost of capital for residential solar projects in a previous post. That post and this one are related, but this one focuses on companies that own a portfolio of assets that might include different types of solar, wind, and other assets. We also take a somewhat more nuanced approach to some of the inputs here. We use 1.78% as the current risk-free rate, which is the current rate on a 10-year U.S. Treasury bond. We chose the 10-year bond because we think it is reasonable for an investor with a long-term investment horizon. If an investor had a much shorter horizon, the rate on a 1-year Treasury bill might be more appropriate. One might also argue that since solar and wind assets last 20 or 30 years we should use the rate on a 20- or 30-year bond. However, an investor is unlikely to hold the asset for its full term. Additionally, the longer term bonds expose an investor to more interest rate risk. We believe, therefore, the 10-year bond is appropriate. Financial theory gives us many ways to calculate the equity risk premium; it is one of the most controversial elements in the CAPM. To highly simplify, one approach is to take the difference between what you think returns on stocks and bonds will be in the future. 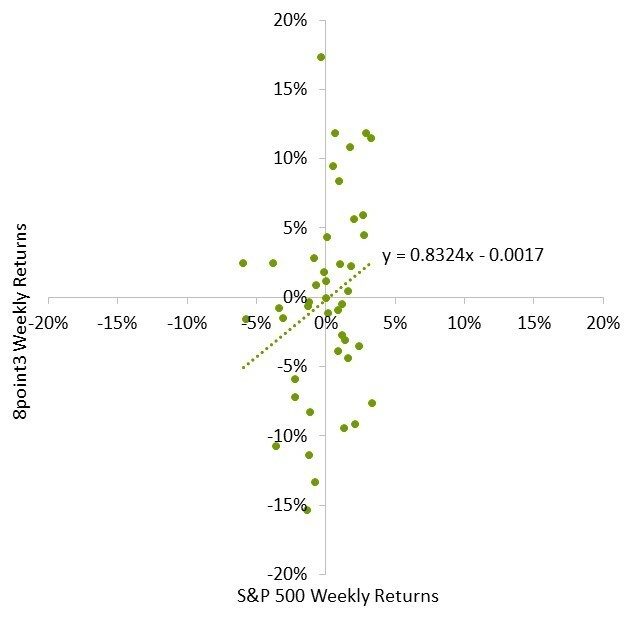 Another approach is to look at the historical relationship between stock and bond returns. We choose the latter approach because, as long term investors, we want to be neutral as to whether the market is currently under- or over-valued. Someone who invested $100 in the S&P500 on January 1, 1928, would have had $300,725 on December 31, 2015, a compound annual growth rate of 9.53%. If that person had invested in 10-year U.S. Treasury bonds instead, he or she would have had $7,041, a compound annual growth rate of 4.95%. The difference between these, 4.57%, is the ERP over this 88-year period. One troubling aspect to this approach is that, despite the really long time period, the answer is somewhat sensitive to the starting and ending dates. For example, if we ended our calculation in 2008 (a disastrous year for stocks) instead of 2015, we would have concluded the ERP was 3.90%. The ERP has been higher than 4.45% in some years and lower in others. The average over the last ten years has been 4.45%, which is what we use in our calculations in the rest of this analysis. For more information on the equity risk premium, review this paper from the Federal Reserve Bank of New York, which estimates an average equity risk premium of 5.7% using a variety of different models (see page 29 in their paper) and this paper from Aswath Damodaran at NYU, in which he found the long-term equity risk premium to be 4.29% (see pg. 25). Using 8point3 as an example, we find a levered equity beta of 0.83 (see Figure 1). This indicates 8point3 stock is less volatile than the market overall. On average, a 1% change in the S&P was associated with a 0.83% change in 8point3 stock. With all of the appropriate inputs, we can now calculate the levered cost of equity for 8point3. The levered cost of yieldco equity shows us what kinds of returns investors in a company’s stock should insist upon, at a minimum, but we can’t easily compare across companies because each may have different amounts of leverage. To make the figures comparable, we calculate an unlevered cost of equity, which assumes the company is financed only with equity. We already have 8point3’s levered equity beta, which we calculated above. It’s equity value is approximately $1 billion as of this writing. Where rdebt is the expected return on the company’s debt and the other variables are as described above. Since the risk of default on this debt is quite low given 8point3’s relatively low leverage, we take the coupon rate of the debt as the expected return on debt. If the risk of default were nontrivial, we would want to adjust the rdebt to reflect the fact that expected return is lower than the coupon rate on the debt. The market value of debt comprises three pieces – long term debt, short term debt, and tax equity. We include tax equity along with debt because in most structures that use tax equity the tax equity investors are effectively senior to regular equity. In fact, some yieldcos (such as TerraForm Power and TerraForm Global) account for tax equity in the liabilities sections of their balance sheets. We use the book value of debt as a proxy for market value. Most corporate debt is not traded on a public exchange the way that a company’s stock might be. Our assumption should be a good one if the risk of default and market interest rates are similar to those when the debt was issued. Now that we have all the elements, we can calculate our unlevered equity beta. Our unlevered cost of equity is lower than the levered cost of equity. This makes sense because any debt has a senior claim on cash flows, thus increasing the riskiness of equity in levered companies. To broaden our analysis, we used the above methodology to calculate the cost of equity for a number of other public yieldcos. We found an average cost of equity of 7.01% levered and 5.46% unlevered. A developer or corporation without a yieldco could make the argument that it should discount cash flows from projects at these lower rates because they reflect the risks inherent to the projects, but in our experience they frequently lose these battles with their own investors. Link to PDF version of this post. Woodlawn would be happy to assist you with any questions about energy project finance. Please contact or Josh Lutton or Shirley You. Nice Article to understand cost of capital for Yieldco. A question. What makes yieldcos not to owe taxes? My guess: They usually have excessive tax credits so that they do not owe taxes. Rather, they use a tax equity vehicle to monetize extra tax credits. Therefore, tax rate should be assumed as 0%. But, what about the period after the tax credits expired? Does a yieldco need to pay taxes after that? The plan is usually for the yieldco to continue to acquire projects. When the earlier projects start generating taxable income there should be new projects with tax credits and/or depreciation that offset that income.